2. 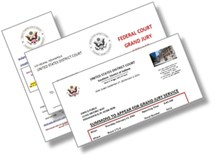 Summons to Appear for Grand Jury Service - You may receive a Summons to Appear to participate in jury selection for grand jury service. 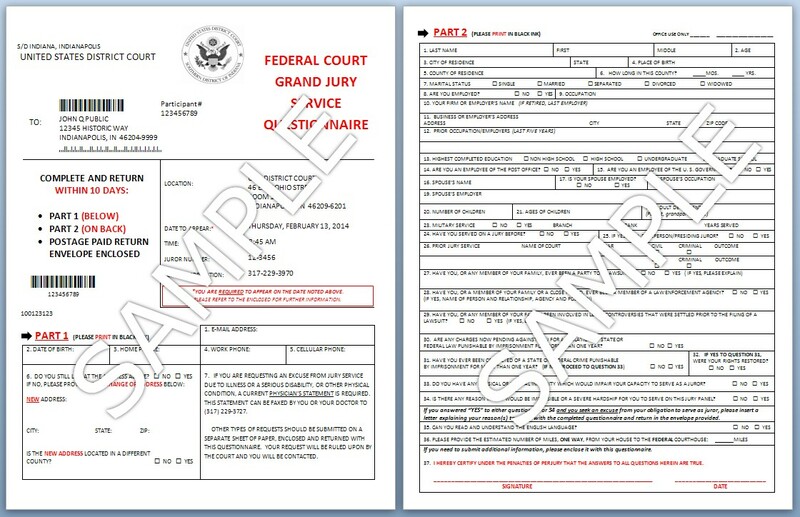 A Federal Court Grand Jury Service Questionnaire is also enclosed, which must be completed within 10 days of receipt and returned to the court in the business reply envelope provided. 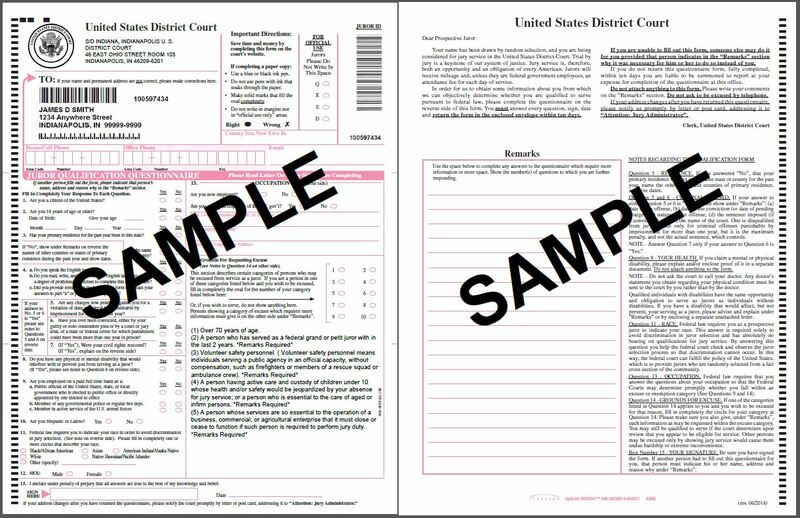 Summons packets are usually mailed approximately 4 to 6 weeks in advance of your scheduled reporting date and provide detailed reporting instructions, as well as directions and maps to the courthouse. A grand jury, which normally consists of 16 to 23 members, has a specialized function. The United States Attorney, the prosecutor in federal criminal cases, presents evidence to the grand jury for them to determine whether there is "probable cause" to believe that an individual has committed a crime and should be put on trial. If the grand jury decides there is enough evidence, it will issue an indictment against the defendant. Grand jury proceedings are not open for public observation. There are two types of federal grand juries; regular and special. Regular grand juries sit for a basic term of 6 or 12 months and meet 2 to 4 days per month. Special grand juries sit for 18 months and meet 1 or 2 days per month. 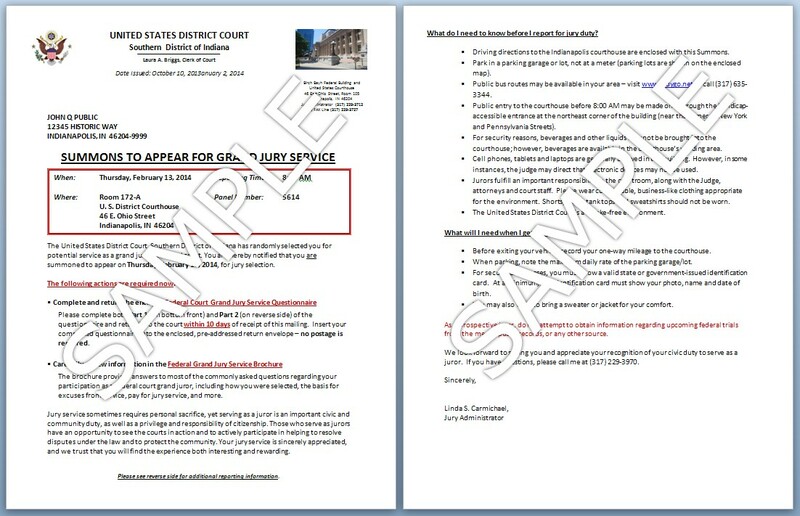 If you are selected to serve as a grand juror, you will be given a schedule of all grand jury sessions in advance. Unlike petit jury service, during a grand juror's term of service, certain days off will be allowed for specific reasons if the juror has been excused in advance. Grand jury service can be somewhat flexible; however, absences should only be requested for truly important reasons since the grand jury must have a quorum of at least sixteen members present to conduct business. Certificates of attendance are prepared for grand jurors after each monthly session.